There is a wide variety of methods and products available for soaking dentures, but Dentanet is considerably more effective than all other products on the market, and there are no negative effects. When you add an effervescent tablet to water, it releases a large volume of oxygen, which destroys odours and food particles. Although these cleaners release a large quantity of oxygen, they cannot eliminate tartar. There is a huge difference between eliminating food particles and truly removing tartar. Brushing with a denture cleaning toothpaste only eliminates food particles and odours. In addition, a brush cannot reach into every space. Denture cleaning toothpastes and gels are useless in terms of dislodging tartar, and must be combined with an effective soaking technique, such as Dentanet. When the super-concentrated Dentanet liquid is combined with water, the active agents soften the water, if necessary. Add 15 ml of super-concentrated Dentanet to water (in a denture bath), and it is ready to use. If necessary, the concentration may be increased. Ask your dental professional. This mixture can be used up to a week. It goes without saying that it is very important to brush with the foaming product your dentures every time you place them in the denture bath. When you remove them from the bath, it is important to brush them under running water. The solution dissolves grainy deposits, stains, odours and particles embedded in small spaces, and above all, removes tartar. Dentanet, unlike powders, does not limit you to a 15-minute soaking but to an overnight soaking. For all of these reasons, Dentanet far surpasses all other denture cleaners. 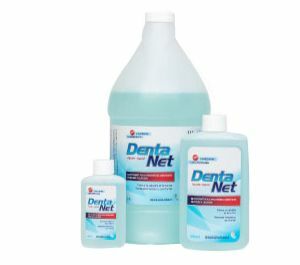 Use Dentanet Super-Concentrate and Foaming Product regularly to keep your dentures fresh and clean, at a very competitive price. 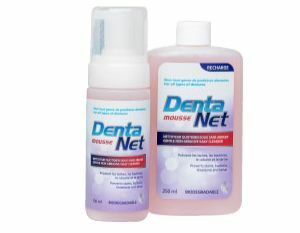 Manufactured and distributed by an experienced denturologist, Dentanet is a liquid cleaner for all types of dentures. Ensure that all your dentures are clean and fresh with this revolutionary liquid that eliminates food particles, odours and tartar. Developed by an expert in 1993, the Dentanet formula is not harmful to acrylic, metal, titanium, nylon or any other materials used for dentures or orthodontic appliances. The product is completely biodegradable and easy to use, and is intended for use by individuals as well as dental professionals. The new Dentanet foaming cleaner, designed to clean any type of dental material, is finally available. This daily foaming cleaner is gentle and non-abrasive. The Dentanet foaming product cleans, prevents stains, bacteria, sediment, and tartar build-up. This is an exclusive and competitive product distributed only to dental professionals. Give yourself the best of the best: This super-concentrated foam is an excellent natural and biodegradable soaking product. With the purpose of being as eco-friendly as possible, a 250 ml refill is also available. Finally, another excellent natural and biodegradable product at Dentanet. Place your order today! Dentanet can be delivered anywhere in Canada.